Take out the buttermilk from the fridge and keep outside overnight to become sour. For places like mine which are very cold and kadhi is desired to be made in the winter months (just like I did on the New Year's eve), I added yogurt with water in the mixer and blend it till fine consistency, no particles are found. Then add salt and half the curry leaves and cover. Turn on the light in the oven for 30 minutes, turn off the light and keep the container in over overnight, covered with some warm blanket or sheet; it will become sour in about 20 hours. To this sour yogurt, add the chickpea flour (besan) slowly while mixing it thoroughly with the yogurt. Add 3 cups of water, turmeric and red chilli powder and start boiling on medium-high flame. Keep a check on the consistency and add more water if the kadhi begins to become thick. Ideally kadhi is of thin consistency. Bring it to a rolling boil and turn the flame to medium and let cook for about 10-15 minutes. By that time, prepare the tadka or tempering. Heat oil and crackle the mustard seeds. Add dried red chilli, curry leaves, cloves and asafoetida and let everything splutter for half a minute. Add the chopped onions and fry until they are transparent. Add the garlic and fry for about a minute. Add the garam masala and red chilli powder and turn off the flame. Pour all this tempering over the kadhi and mix well. Simmer for 5 more minutes and turn off the flame. Add the pakodas and cover for 10 minutes. This will help the pakodas become soft from inside. Remove cover and serve piping hot with jeera rice !! I like to make pakodas with onions for the kadhi, that's how they are traditionally made. But obviously can be made without the onions as well. Add all the spices to the besan (chickpea flour) and mix well. Add water slowly to make a paste. The paste must be a little runny for the kadhi to make them soft. 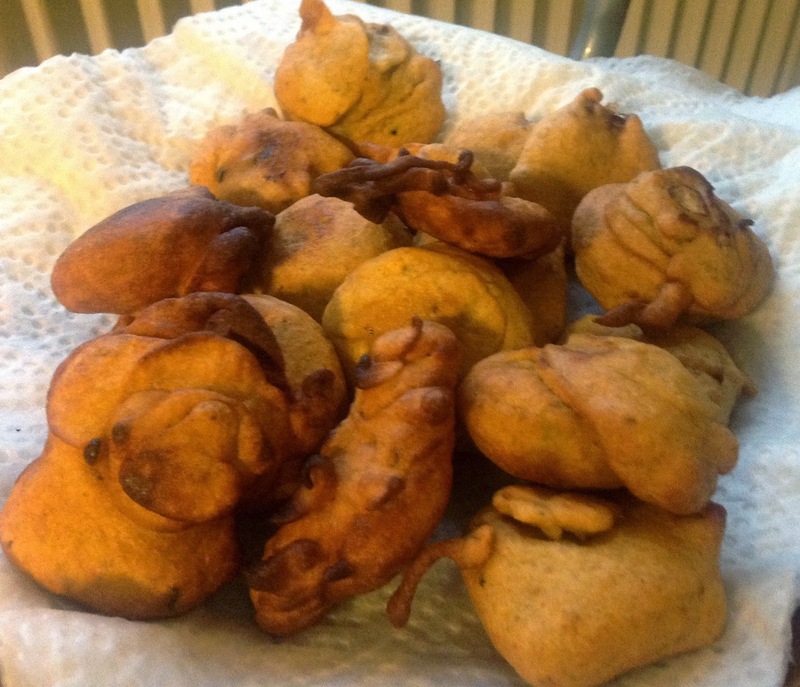 I got this tip from my in-laws' cook who makes wonderfully melt-in mouth pakodas for kadhi. Heat oil on high flame. Add the chopped or cut in rings onions the batter and whisk everything well. When the oil is hot enough (check by carefully dropping a bit of the paste, if it rises up slowly, then it is hot enough). Fill up one spoon with the batter with onions and carefully drop into the oil. Repeat for all the batter. Let cook for 3-4 minutes, keep turning and checking. This will take a total of about 8 minutes. Drain on kitchen paper and let rest for a while. Add the to hot kadhi and cover for about 10 minutes. This will make the pakodas even softer.